Objective To examine whether elevated resting heart rate (RHR) is an independent risk factor for mortality or a mere marker of physical fitness (VO2Max). Methods This was a prospective cohort study: the Copenhagen Male Study, a longitudinal study of healthy middle-aged employed men. Subjects with sinus rhythm and without known cardiovascular disease or diabetes were included. RHR was assessed from a resting ECG at study visit in 1985–1986. VO2Max was determined by the Åstrand bicycle ergometer test in 1970–1971. Subjects were classified into categories according to level of RHR. Associations with mortality were studied in multivariate Cox models adjusted for physical fitness, leisure-time physical activity and conventional cardiovascular risk factors. Results 2798 subjects were followed for 16 years. 1082 deaths occurred. RHR was inversely related to physical fitness (p<0.001). Overall, increasing RHR was highly associated with mortality in a graded manner after adjusting for physical fitness, leisure-time physical activity and other cardiovascular risk factors. Compared to men with RHR ≤50, those with RHR >90 had an HR (95% CI) of 3.06 (1.97 to 4.75). With RHR as a continuous variable, risk of mortality increased with 16% (10–22) per 10 beats per minute (bpm). There was a borderline interaction with smoking (p=0.07); risk per 10 bpm increase in RHR was 20% (12–27) in smokers, and 14% (4–24) in non-smokers. Conclusions Elevated RHR is a risk factor for mortality independent of physical fitness, leisure-time physical activity and other major cardiovascular risk factors. In healthy subjects, the main question is whether a high resting heart rate is an independent risk factor, a surrogate marker of subclinical disease states, or a marker of poor physical fitness. A number of studies have shown that resting heart rate is associated with circulating levels of inflammatory markers related to subclinical chronic disease states.6–8 Resting heart rate is determined by the activity of the autonomic nervous system, levels of circulating hormones and cardiorespiratory fitness.9 ,10 The association between a high level of cardiorespiratory fitness (physical fitness) and a low resting heart rate is well known11 and physical fitness may therefore be an important confounding factor. Most general population studies have included information about self-reported physical activity.12 ,13 However, the correlation between self-reported physical activity and objectively measured physical fitness is only poor to moderate.14 The lack of objectively measured physical fitness in the current literature may have resulted in residual confounding and may have influenced the interpretation of previous findings. In the present study, we investigated whether resting heart rate was predictive of mortality in a population of employed apparently healthy middle-aged men who previously had physical fitness determined by a bicycle ergometer test and were followed for 16 years. Overall, 6125 men were invited to participate; 5249 men (87%) agreed. All men were interviewed by a physician (FG) about a previously completed questionnaire, and had a clinical examination including measurement of physical fitness (VO2Max) using a bicycle ergometer. In 1985–1986 a new baseline was established, which was used for the analyses in the present study together with information on VO2Max measured in 1970–1971. All survivors from the 1970–1971 examination were traced through the Danish National Civil Registry. Between June 1985 and June 1986, 4505 men, except 34 subjects who emigrated and therefore were lost to follow-up, were invited to take part in this new study; 3387 men (75%) agreed to participate and gave informed consent. Their mean age was 63 years (range 53–75). We excluded 33 invalid questionnaires, leaving 3354 men for the analysis; within this group 319 men were excluded because of cardiovascular disease (angina pectoris, acute myocardial infarction, stroke and/or intermittent claudication); a further 34 men without sinus rhythm on ECG were excluded, as were 85 men with diabetes or glucosuria; in all, 2798 men with useful information on heart rate from ECG and measurement of VO2Max from the first baseline in 1970–1971 were included (figure 1). At baseline in 1970–1971, the 1985–1986 non-responders were more likely to be older, smokers, have higher alcohol consumption and higher blood pressure (BP) than the responders. However, the difference in mean levels of physical fitness was small (32.1 vs 32.7 ml/kg/min). Flow-chart for the Copenhagen Male Study. All men were interviewed by a physician (HOH) about a previously completed questionnaire, and were examined with measurements of height, body weight, and BP; a fasting venous blood sample was taken for the determination of serum lipids, and a urine sample for determination of glucosuria. A resting ECG was recorded at the 1985–1986 examination, using a three channel Mingograph-34 by taking 12 standard leads in a supine position. A skilled technician coded according to the Minnesota code. As mentioned, only subjects with sinus rhythm were included in the study. Medical history, smoking habits, alcohol consumption and leisure-time physical activity were assessed from the questionnaire. The men classified themselves as never having smoked, being a previous smoker or being a current smoker. Current tobacco smoking was calculated from information about the number of cigarettes, cheroots or cigars, or the weight of pipe tobacco smoked daily. One cigarette was taken as equivalent to 1 g of tobacco, one cheroot as 3 g and one cigar as 4 g. As previously estimated by means of measurements of serum cotinine, the validity of tobacco reporting was high.17 Cumulative tobacco consumption (in pack-years) was calculated on the basis of information about mean total daily use of tobacco in grams multiplied by the time as a smoker in years divided by 20. In the multivariable analyses, cumulative tobacco consumption was included as a predictor/confounder. The men were subdivided into five social classes, using a modification of a system by Svalastoga18 based on the level of education and the job profile. Men in social class I were predominantly academics and well skilled administrators or executives; men in social class V were unskilled and semiskilled workers. Body mass index (BMI) was calculated as weight in kg divided by height in m2. Serum concentrations of total cholesterol, high density lipoprotein cholesterol (HDL-C) and triglycerides (TGs) were determined using enzymatic assays (Boehringer-Mannheim Biochemica, Mannheim, Germany).19 Fasting lipids were measured only once in each subject. Definitions of high serum TG (≥1.70 mmol/l), low HDL-C (≤1.03 mmol/l), high systolic BP (>130 mm Hg) and high diastolic BP (>85 mm Hg) were based on criteria for definition of the metabolic syndrome according to the Adult Treatment Panel III.20 Low density lipoprotein cholesterol (LDL-C) was calculated using the indirect method as developed by Friedewald.21 Urine samples were examined for glucosuria using a glucose kinase method (Clinistix, Bayer, Leverkusen, Germany). BP was measured on the right arm with the subject seated and after at least 10 min of rest, using a manometer developed by the London School of Hygiene and Tropical Medicine. Information on hypertension treatment was obtained from the questionnaire. Ethics approval from the regional ethics committee was obtained for the second examination in 1985–1986; no approval was possible for the 1970–1971 examination since the ethics committee did not exist before 1980. Information about vital status as of 31 December 2001 was collected through national registers for all subjects who had participated in both the 1970 examination and the 1985–1986 examination. Basic statistical analyses, including trend tests, Kendall's τ B and test for linearity in analysis of variance, and regression analyses were performed. The population was divided into categories of resting heart rate. Relative risks were estimated by exp(β), where β is the hazard coefficient for the variable of interest in a Cox proportional hazards regression model, using the maximum likelihood ratio method and a backward stepwise elimination procedure.22 Assumptions regarding the use of Cox proportional hazards were met by inspection of the log minus log function at the covariate mean. First, we studied the correlation between physical fitness measured at the first examination and level of resting heart rate measured at the second examination. Second, we studied the relationship between resting heart rate and mortality in Cox models adjusting for: (1) age alone; (2) age and physical fitness (VO2Max); (3) age, leisure-time physical activity, tobacco consumption and alcohol intake; (4) age, BMI, systolic and diastolic BP, serum TGs and serum total cholesterol; and (5) in a fully adjusted model including all potential confounders from analyses 1–4. Also, based on findings from a previous study showing an interaction with smoking status, resting heart rate and mortality,23 we performed a subanalysis stratifying the population according to smoking status. A two-sided probability value of p≤0.05 was a priori taken as significant. A total of 2798 subjects were included in the current study; 1082 men (38.7%) died during the 16 years of follow-up. Table 1 shows baseline characteristics according to categories of resting heart rate. As shown, high resting heart rate was associated with lower physical fitness, and higher BP, total cholesterol, TGs and BMI. There was no difference in age or social class. Interestingly, subjects in the lowest resting heart rate categories were more likely to be smokers than in the higher resting heart rate categories. There was a highly significant correlation between VO2Max and resting heart rate (R=−0.34, p<0.001) (figure 2). Subjects with higher levels of physical fitness were more likely to have lower resting heart rates. Relationship between physical fitness (VO2Max) and resting heart rate (bpm). Overall, a high resting heart rate was a significant predictor of mortality. As shown in table 2, subjects with elevated resting heart rate were at significantly greater risk of mortality in all models (1–5). In the fully adjusted model, resting heart rate in the range 51–80 bpm was associated with about a 40–50% increase in risk, a resting heart rate in the range 81–90 bpm conferred a twofold increase in risk, and resting heart rates above 90 bpm risk conferred a threefold increase in risk compared to subjects in the lowest heart rate category (<50 bpm). In a fully adjusted model with heart rate as a continuous variable, elevated heart rate was associated with an increased risk of 16% (10–22) per 10 bpm increase in resting heart rate. There was a borderline significant interaction between resting heart rate, smoking status and mortality (p=0.07). In the fully adjusted model and with resting heart rate as a continuous variable, risk increased with 20% (12–27) in smokers, and 14% (4–24) in non-smokers per 10 bpm increase in resting heart rate. In the present study of healthy middle-aged men, the main finding was that resting heart rate was a risk factor for mortality independent of physical fitness (VO2Max) and other major potential confounders. Resting heart rate as a risk factor for mortality has received considerable attention in recent years. However, a concern has been whether elevated resting heart rate is merely a surrogate marker of poor physical fitness, which in turn is associated with poor prognosis. A high level of physical fitness is a strong predictor of longevity11 and is associated with lower heart rate, as also demonstrated in the present study. Level of physical fitness therefore plays a pivotal role in the study of resting heart rate. In a study from the Paris Prospective Study, resting heart rate was predictive of mortality and especially sudden death after adjusting for duration of exercise.24 However, the main body of studies use self-reported levels of physical activity22 ,25 or, in some cases, include no information.26 In the current study, all subjects underwent a physical exercise test and estimation of VO2Max as well as an assessment of leisure-time physical activity; we found that irrespective of level of physical fitness subjects with high resting heart rates fare worse than subjects with lower heart rates. This suggests that a high resting heart rate is not a mere marker of poor physical fitness but is an independent risk factor. There were more smokers in the low heart rate categories than in the higher heart rate categories. Although the acute effects of smoking are tachycardia and increase in BP, healthy smokers are more likely to have lower BP than non-smokers; this has been shown in numerous studies,27–29 and the same mechanisms may explain the observation in the present study. The possible mechanisms are at least twofold and probably pertinent to heart rate as well: first, it represents a counter-regulatory physiological response to the acute rise in BP and heart rate following smoking; and second, the healthy worker effect probably plays a role—smokers in the present study are healthier, leaner and more fit than non-smokers; they can ‘endure’ the smoking. Interestingly, we found a borderline significant interaction between resting heart rate, smoking and mortality, which suggests that high heart rate at any given resting heart rate level is associated with greater risk in smokers than in non-smokers. In a study from the Copenhagen City Heart Study,23 resting heart rate was a stronger predictor of all-cause mortality among smokers than among non-smokers, which is in line with results from the present study. That this relationship can be found in two different large cohorts adds to the evidence that a true relationship may exist and not simply be a random association. Considering that the number of smokers globally is about 1 billion,30 this is yet another argument for preventive measures against tobacco consumption and might have therapeutic implications in terms of heart rate monitoring and perhaps modification in smokers. Several pathophysiological mechanisms have been proposed to explain the relationship between high resting heart rate and mortality.31 ,32 Resting heart rate has been found to correlate with longevity in mammals. Levine33 showed that the number of heart beats per lifetime is the same across different mammal species, indicating that basal metabolic effects may explain the effect of high resting heart rate on mortality. Smoking is known to promote inflammatory pathways and induce alterations in metabolism, vessel walls, haemostatics and impaired blood flow34 ,35; also, high heart rate may promote the development of atherosclerosis and plaque rupture through increase in cardiac work, decreased artery compliance and increase in arterial wall stress.36 Altogether, these mechanisms could be related to the findings of this study. Studies investigating cause-specific mortality, be it mainly mortality from cardiovascular reasons, cancer or other disease entities, may further elucidate the relationship between elevated resting heart rate and longevity. Possible study limitations should be considered. Since all subjects were employed and recruited from work places, there may have been a ‘healthy worker’ effect, resulting in the study population being healthier than would be seen in the general population. Also, there may have been a survivor selection bias. Since resting heart rate and VO2Max were measured at different examinations, only subjects who survived to attend both examinations were included in the study. This may have biased the results towards the null hypothesis, making the observed HRs smaller than the true HRs. Heart rate shows diurnal variation, which may give some imprecision in the estimate of resting heart rate; however, misclassification of heart rate due to a single assessment would bias the results towards the null hypothesis and can therefore not explain our findings. Finally, it should be mentioned that since the results presented here are based only on findings among healthy, middle-aged and elderly Caucasian men, our results may not necessarily apply to other population groups. In the present study of 2798 healthy, middle-aged and elderly Caucasian men followed for 16 years, resting heart was a risk factor for mortality independent of physical fitness (VO2Max) assessed by a bicycle ergometer, leisure-time physical activity and other conventional risk factors. These results suggest that in healthy subjects, elevated resting heart rate is not merely a marker of poor general fitness but an independent risk factor.
. Resting heart rate is a risk factor for cardiovascular and noncardiovascular mortality: the Chicago Heart Association Detection Project in Industry. Am J Epidemiol 1999;149:853–62.
. Heart rate as a prognostic factor for coronary heart disease and mortality: findings in three Chicago epidemiologic studies. Am J Epidemiol 1980;112:736–49.
. Resting heart rate is associated with cardiovascular and all-cause mortality after adjusting for inflammatory markers: the Copenhagen City Heart Study. Eur J Prev Cardiol 2012;19:102–8.
. Heart rate during myocardial infarction: relationship with one-year global mortality in men and women. Can J Cardiol 2002;18:495–502.
. Long-term prognostic value of resting heart rate in patients with suspected or proven coronary artery disease. Eur Heart J 2005;26:967–74.
. Increased heart rate and reduced heart rate variability are associated with subclinical inflammation in middle-aged and elderly subjects with no apparent heart disease. Eur Heart J 2004;25:363–70.
. Heart rate and microinflammation in men: a relevant atherothrombotic link. Heart 2007;93:940–4.
. Heart rate, autonomic markers, and cardiac mortality. Heart Rhythm 2009;6:S68–75. Jensen MT, Marott JL, Lange P, et al. Resting heart rate is a predictor of mortality in chronic obstructive pulmonary disease. Eur Respir J. 2012 Nov 8. [Epub ahead of print].
. Physical fitness as a predictor of mortality among healthy, middle-aged Norwegian men. N Engl J Med 1993;328:533–7.
. Resting heart rate as a low tech predictor of coronary events in women: prospective cohort study. BMJ 2009;338:b219.
. The association of resting heart rate with cardiovascular, cancer and all-cause mortality. Eight year follow-up of 3527 male Israeli employees (the CORDIS Study). Eur Heart J 2000;21:116–24.
. Does a variation in self-reported physical activity reflect variation in objectively measured physical activity, resting heart rate, and physical fitness? Results from the Tromso study. Scand J Public Health 2010;38:105–18.
. 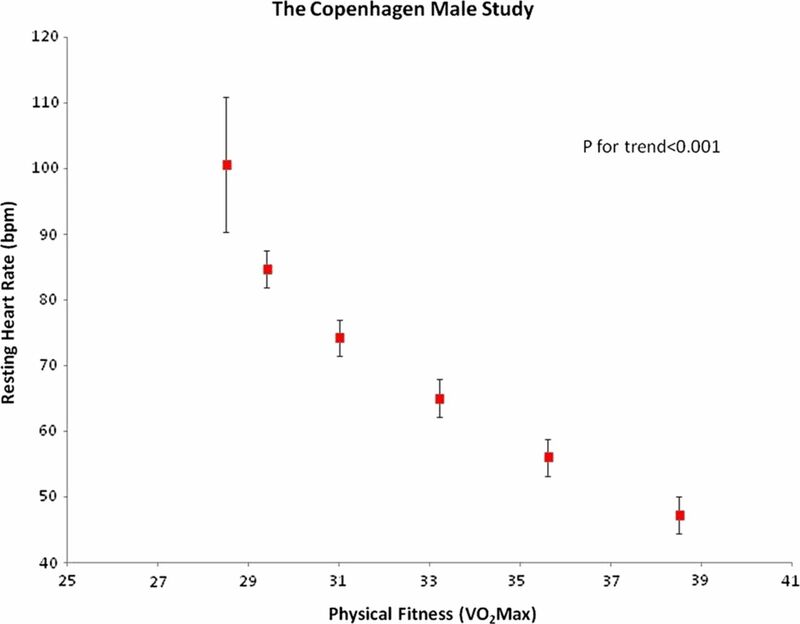 Physical fitness and coronary heart disease in Copenhagen males aged 40–59. II. Dan Med Bull 1973;20:105–12.
. One- and two-years incidence of myocardial infarction in Copenhagen males aged 40–59. Dan Med Bull 1975;22:81–4.
. Serum validated tobacco use and social inequalities in risk of ischaemic heart disease. Int J Epidemiol 1994;23:293–300.
. Prestige, Class, and Motility. Munksgaard, Copenhagen, Denmark.
. A practical enzymatic cholesterol determination. Med Lab (Stuttg) 1977;30:29–37.
. Recent National Cholesterol Education Program Adult Treatment Panel III update: adjustments and options. Am J Cardiol 2005;96:53E–9E.
. Walking pace, leisure time physical activity, and resting heart rate in relation to disease-specific mortality in London: 40 years follow-up of the original Whitehall study. an update of our work with professor Jerry N. Morris (1910–2009). Ann Epidemiol 2010;20:661–9.
. Heart-rate profile during exercise as a predictor of sudden death. N Engl J Med 2005;352:1951–8.
. Heart rate, ischaemic heart disease, and sudden cardiac death in middle-aged British men. Br Heart J 1993;70:49–55.
. Predictive value of clinic and ambulatory heart rate for mortality in elderly subjects with systolic hypertension. Arch Intern Med 2002;162:2313–21.
. Blood pressure in smokers and nonsmokers: epidemiologic findings. Am Heart J 1986;111:932–40.
. Association between smoking and blood pressure: evidence from the health survey for England. Hypertension 2001;37:187–93.
. Relationship between blood pressure and physical fitness, smoking and alcohol consumption in Copenhagen males aged 40–59. Acta Med Scand 1974;195:375–80. WHO. Tobacco facts. WHO. http://www.who.int/tobacco/mpower/tobacco_facts/en/index.html (accessed 20 May 2012).
. Heart rate as an independent risk factor for cardiovascular disease: current evidence and basic mechanisms. Drugs 2007;67(Suppl 2):3–13.
. Heart rate lowering by specific and selective If current inhibition with ivabradine. A new therapeutic perspective in cardiovascular disease. Drugs 2004;16:1757–65.
. Rest heart rate and life expectancy. J Am Coll Cardiol 1997;30:1104–6.
. Smoking, haemostatic factors, and cardiovascular risk. Curr Pharmaceutical Design 2007;13:1661–7.
. Endothelial dysfunction, impaired endogenous fibrinolysis, and cigarette smoking. A mechanism for arterial thrombosis and myocardial infarction. Circulation 1999;99:1411–5.
. Retarding effect of lowered heart rate on coronary atherosclerosis. Science 1984;226:180–2. Contributors All authors have substantially contributed to the manuscript in terms of conception and design, analysis and interpretation of data, drafting the article, revising it critically for important intellectual content, and final approval of the version. Funding The Copenhagen Male Study was supported by grants from the King Christian X Foundation, the Danish Medical Research Council, the Danish Heart Foundation, and the Else and Mogens Wedell-Wedellsborg Foundation. Ethics approval The study was approved by the ethics committee for medical research in the County of Copenhagen.